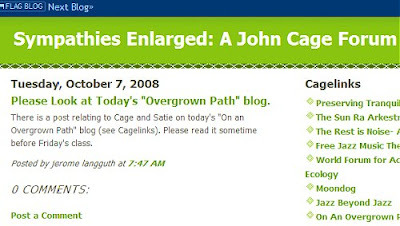 Spotted on Sympathies Enlarged: A John Cage Forum. Perhaps it's all to do with cleaning the ears of the musically educated. Thanks for noticing our humble class blog. The writing on the blog is by students at Thomas More College (in Crestview Hills, Kentucky, USA) who are enrolled in a first year seminar class called "Listening to the Silence: John Cage and Experimental Music." On an Overgrown Path is, of course, on our required reading list. Indeed, the many thoughtful posts on Cage I found on this blog were a major source of inspiration for the course syllabus.